One of the chief issues is returning pallets from general use after they have been picked or processed. Typically this is done by hand, so that forklifts can retrieve stacks of them to take either to outbound trailers, bulk storage or other areas. The return process is where much of the labor and trouble resides. 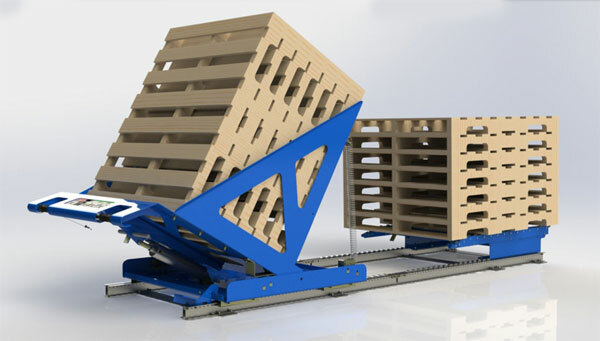 This device makes it easy for workers to make near-perfect stacks of pallets with less effort and in a safer manner because it reduces the amount of time they have to lift the pallet, the distances they have to lift them, and the effort it takes to stack them. Instead of hoisting one pallet on top of the next, you just add a pallet to the backward-tilting pallet carriage until it’s full – up to 7 pallets. The carriage straightens each pallet when they’re loaded. Workers simply tip the pallet against the pallet return device and then use a pivoting motion to lift the pallet and tip it forward onto the stack. Once the carriage is full, the pallets are lowered to a level position and the brake is released so the carriage can glide forward on the flow rails the unit is mounted to, to the pick up position. The listed device is meant for floor mounting, and can handle two stacks at the same time, but there are also pick module styles that work on multilevel systems, where pallet management is frequently an issue. If you consider the sheer number of pallets you’re dealing with daily, and the number of times someone has to manually lift or turn them, measures that reduce this burden are always advisable.